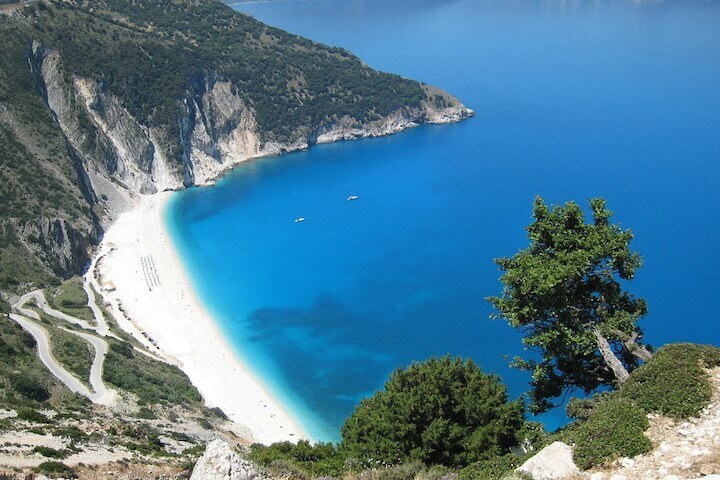 Cephalonia (or Kefalonia) is one of Greece's most majestic islands, green, very clean, with clear waters. The landscape is very steep and peaks on Mount Ainos at 1,628 metres. It is a lively island, which has a very satisfying night life without being dedicated to night owls. The villas of Villanovo are located in the capital Argostoli or on the beach of Myrtos near Asos. 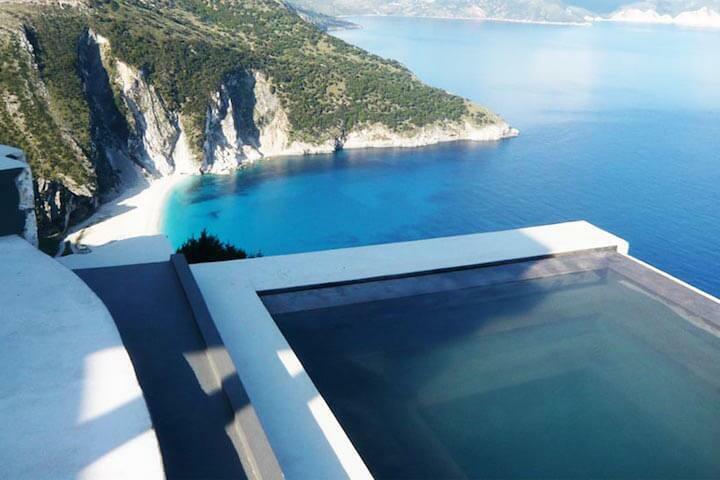 They all have a stunning view of the Ionian Sea and have a private pool. In 1953, the dwellings of the island were destroyed by an earthquake (except some towns of the North such as Fiskardo). Fortunately, the reconstruction work of Kefalonia was thought of without including wild concreting but wanting to recreate traditional architecture. 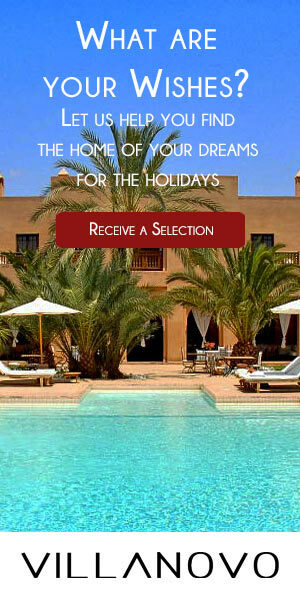 Looking for a holiday in the countryside? 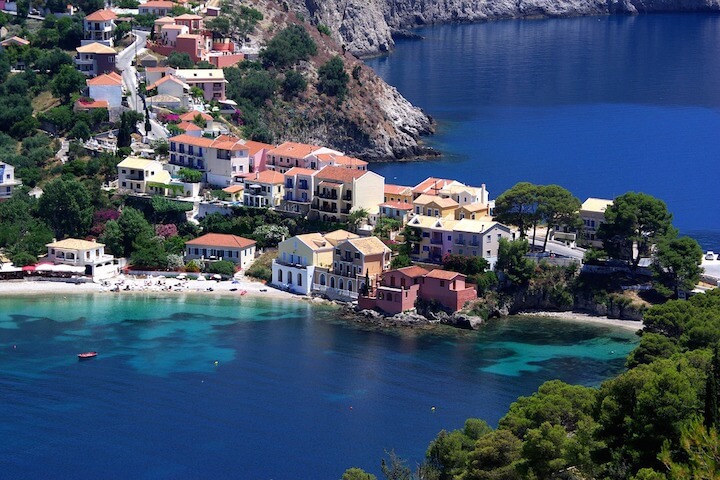 Kefalonia is certainly the ideal island for this type of trip. Unique facts in Greece, you can come across wild horses, living freely, goats and rabbits with gold teeth (the gold density of the soil has caused this phenomenon) along your hike in the mountain near Mount Ainos. A variety of pines are unique on the island, you will see this tree everywhere on the heights (the Kefalonia fir). On the sea side, nature is also very protected. The waters are pure and enjoy a fairly strict environmental protection. The caretta turtles are very numerous, you can swim with the dolphins and come across the monk seals. > The beach of Fiskardo, perhaps the most beautiful traditional village of the island. How to travel on the island and what activities are proposed? If you intend to visit the whole island, renting a car is definitely the best option, especially to reach places that are not accessible by public transport (bus and Ferry Boat). Another possibility is to rent a taxi by the day (you will have to negotiate the day rate). You can also very easily rent a scooter and / or bikes. Overall, you can enjoy all the watersports on the island: sailing, surfing, board, diving, snorkelling... And it is a pleasure to practice them in pure water. Fishing is also accessible. Visit the bays of the island for fishing or angling. You will meet the fishermen of the island, and enjoy your booty around a barbecue in your villa. Horseback riding is also ideal on the island, with the possibility of many rides. For hiking enthusiasts, the paths are well laid out, for a walk or mountain bike ride. In the evening, taverns, bars and restaurants are concentrated in Argostoli, but some cities offer you very nice places: Sami, Lixouri, Poros, Fiskardo. In high season (July and August), the streets are much more lively... And you can also have fun at the famous beach-parties of the island. For family outings with children, Argostoli has a really welcoming outdoor cinema, a go-kart for all ages and a space in the city where children can drive on mini-karts and mini-motorbikes. Shopping and gastronomy are somewhat associated on the island. The wines produced locally: Robola wine and Calliga wine which are of high quality. Without forgetting the honey of the island called golden honey! You can also invest in a beautiful embroidered blanket or plaid, in original jewels and in artistic works by the painters who meet in the port of Fiskardo. The island of Ithaca is very close to Kefalonia. Here there is no mass tourism, celebrities are fond of yachts and beautiful detached houses, far from the crowds. The capital is Vathy, the largest natural harbour in the world. Here you can discover the cave of the nymphs and an archaeological museum. It is also a landmark for artists where they can meet in galleries, but also in bars and taverns in the evening. The town of Kathara is famous for the monastery of the Virgin Mary (Panagia), a visit here will make you discover beautiful religious icons and splendid landscapes. The most beautiful beaches are those of Vathy, Frikes and Kioni. On the programme: snorkelling and total relaxation! Fish specialties and sweet dishes are not to be missed! The island is very mountainous, a bus line connects Vathy, Frikes and Kioni. 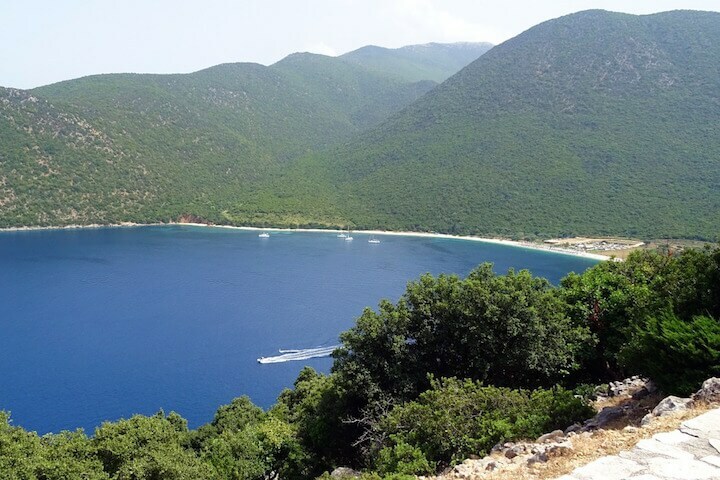 The island of Kefalonia and Ithaca are a variation of the Ionian islands: really exciting, clear water, mountain, an idyllic and cheerful landscape... At Villanovo we offer a selection of villas available for exclusive rental in Kefalonia.